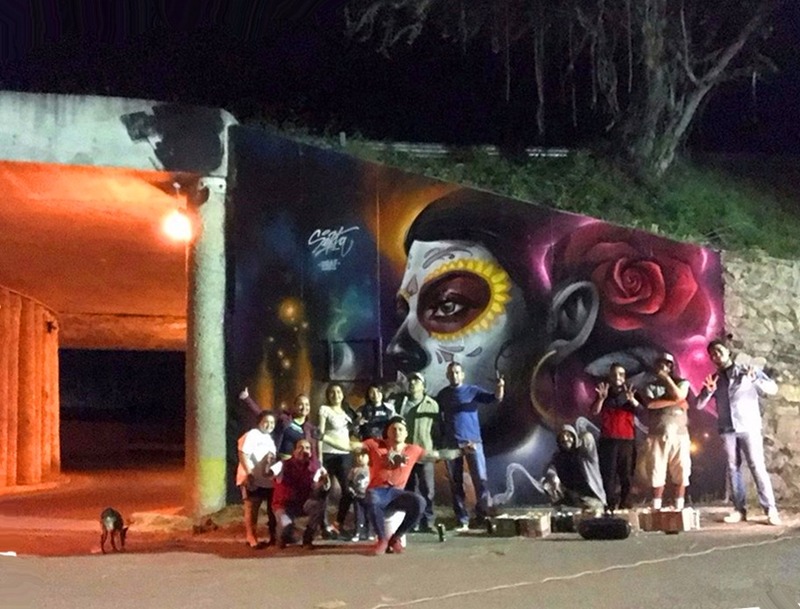 The Sekta Urban Art team of graffiti painters show off their work. 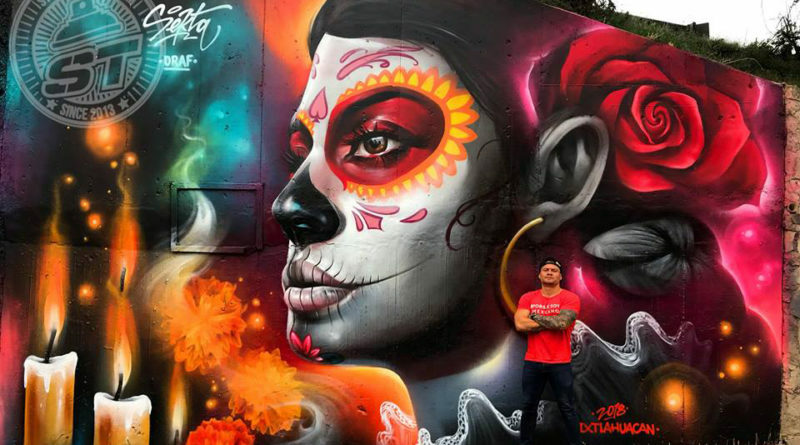 The colorful mural depicting Day of the Dead imagery was conceived and painted by artist Fredy Muñoz “Sekta” and his crew from Guadalajara-based Sekta Urban Art and help from some locals, which specializes in graffiti-style murals. Northbound attendees of the festival will pass the mural as they exit the town of Ixtlahuacan. In addition to the mural, the 4th Annual Majestic Day of the Dead Event will feature a parade, concerts, contests and entertainment of all sorts. An estimated 50,000 people will flock to the small town of Ixtlahuacan in the coming days to share in the Nov 1-4 festival. The ‘Desfile de las Novias Alegres,” a parade where young women dress in bridal costumes and catrina makeup compete for prizes of $3,000, $5,000 and $7,000 pesos. The parade will take place mid-day Nov. 4. Typically, over 250 contestants of all ages compete in the “Concurso Personificación de Catrinas” (Best Catrina Costume contest). The entrants – men, women, children and couples, spare no expense or effort in fabricating elaborate and colorful costumes and makeup. The Catrina contest will take place Nov. 4. Several categories (including one for small children, one traditional and one for the most innovative costume) offer prizes of up to $30,000 pesos in total. On Nov. 3, construction on close to 100 Altars to the Dead will be begin at 7 am, and must be finished and lit with candles by 8 pm. The altars will fill the main avenue leading from the Chapala-Guadalajara Carretera to the Ixtlahuacan plaza. Intricate altar decorations are made of a wide variety of materials, such as corn kernels, black beans, colored sand, flowers and more.The street is closed to traffic and decorated days ahead. The altars pay homage to well-known contemporary or historical figures. The altar-builders aspire to winning a total of $145,000 pesos in Regional and National peso prize money. A giant painted “calavera” (skull) is seen in the Ixtlahuacan plaza this year, next to the area’s largest and highest flag and flagpole. 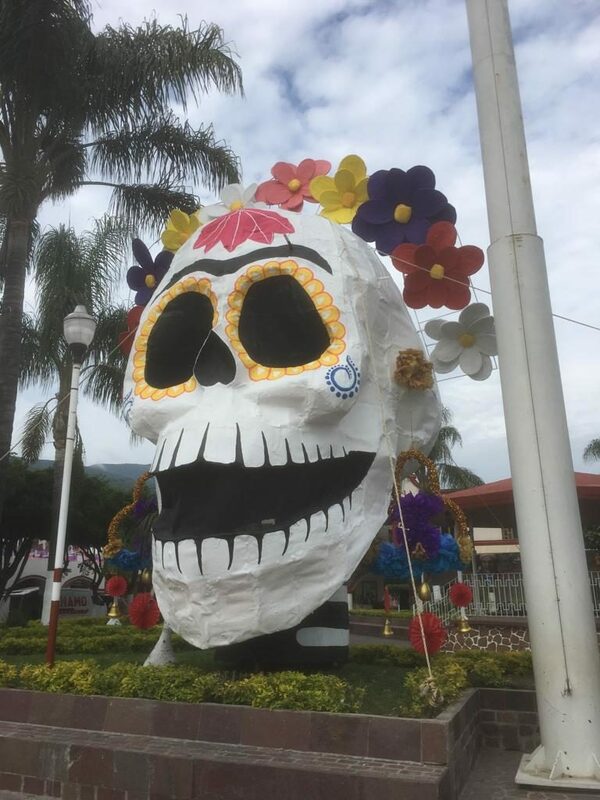 Last year, the townsfolk and municipal employees went a step further, when around $90,000 pesos and days of ‘round-the-clock work went into building a giant Catrina in the town plaza. The catrina reportedly measured 31.7meters (104 ft.) in height, presumably making it the World’s Largest Catrina. Town officials felt there was no need to spend an additional $10,000 from the public treasury for Guinness certification, but townsfolk felt they accomplished their objective of keeping the Day of the Dead tradition alive. Editor’s Note: Click here to see a related Best of Lake Chapala article by Kristina Morgan called Day of the Dead very much Alive in Mexico.